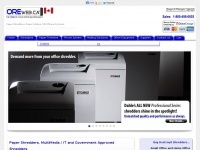 OREweb.ca is an office equipment dealer in Canada. We offer commercial business paper shredders and document mailing solutions including: dahle paper shredders, destroyit ideal-mbm, HSM, cross cut and strip cut paper shredders for business. ORE-Office Resources Equipment is specified as the websites creator. 6. Triumph Heavy Duty Guil­loti­ne Cut­ters /con­tents/en-ca/d225_heavy_duty_guil­loti­ne_stack_paper_cut­ters.ht..
8. Dah­le - Go­vernment Appro­ved Shred­ders /con­tents/en-ca/d174_go­vernment_canada_appro­ved_shred­ders_dahle.h..
9. Destro­yit Go­vernment Appro­ved Shred­ders /con­tents/en-ca/d188_destro­yit_ideal_go­vernment_appro­ved_shred­der.. The web server used by Oreweb.ca is located near the city of New York, USA and is run by Peer 1 Network (USA). 50 other websites are located on this web server. Most of them are provided in the english language. The websites of Oreweb.ca are served by a Apache server. The HTML pages were created with the latest standard HTML 5. The website does not specify details about the inclusion of its content in search engines. For this reason the content will be included by search engines.